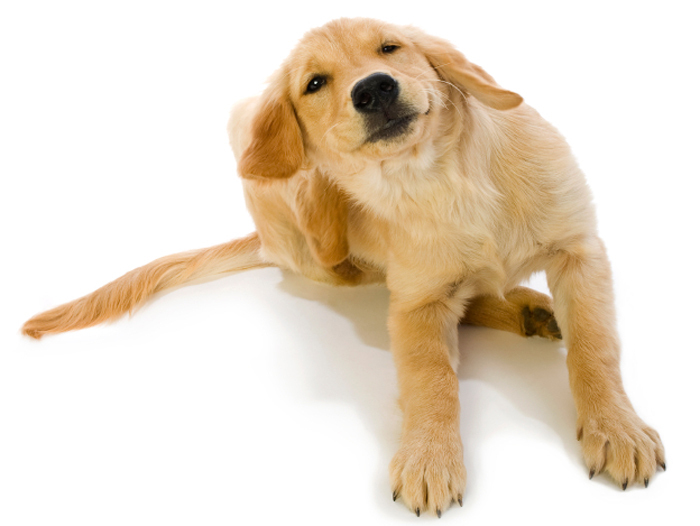 Why d o dogs get these skin infections? Compared to other companion animals, dogs seem to struggle the most with bacterial skin infections. Why do they get these skin infections? Dog skin is unique as it lacks a fatty plug that is present in other animals including humans. The most common isolated bacterium from dogs is Staphylococcus pseudintermedius. This bacterium causes the hair to fall out and can cause our dogs to itch. However, it is important to know that the dog isolate is not as dangerous or virulent as the human isolate of Staphylococcus aureus. Physicians have been treating methicillin-resistant Staphylococcus aureus or MRSA in their human patients for years. MRSA is a bacteria that has developed resistance to many types of antibiotics making many antibiotics useless. The resistance mechanisms seen in the human MRSA are now being seen by veterinarians in the dog isolate Staphylococcus pseudintermedius. This change limits the effectiveness of many of the available antibiotics. This does not make the bacteria more dangerous or virulent, it just makes the bacteria more difficult to resolve. The dog Staphylococcus pseudintermedius is not considered highly contagious to other dogs or humans. However, in rare cases, people with poor immune systems (receiving chemotherapy, immune-suppressive medications, etc.) can acquire this infection from dogs. It is recommended to wash hands after handling an infected pet as the skin infection resolves. A small percentage of dogs and cats can become colonized or infected with the human Staphylococcus aureus. When this occurs more cautious recommendations will be given. There are several ways to diagnose a bacterial skin infection. The most accurate way to diagnosis this condition is to culture the skin. A skin culture is becoming a more common procedure in the veterinary clinic. During this procedure, a sterile cotton tip applicator is applied to the skin and the sample swab is placed into a tube and submitted to an outside laboratory. The culture is used for bacterial growth and the laboratory will isolate and identify the bacteria. These isolates are then challenged with individual classes of antibiotics. Based on the growth response to a given antibiotic the bacteria will be classified as resistant (cannot use) or susceptible (can use). This data will help the veterinarian choose the best antibiotic for the affected individual. A veterinarian can simply choose an antibiotic without a skin culture; however, this choice may or may not help your pet. One of the best ways to reduce bacterial infections is bathing. For some dogs whose bacteria have become resistant to all antibiotics, bathing is the only option we have. Sometimes, daily bathing with a chlorhexidine shampoo or a dilute bleach formula can resolve a superficial infection without antibiotics. Conclusion: Dogs commonly develop bacterial skin infections by the isolate Staphylococcus pseudintermedius which is different from the human strain Staphylococcus aureus. The dog Staph has developed changes in its genetics where not all antibiotics will work to resolve a given skin infection. So, a skin culture and/or frequent baths are often needed if prescribed antibiotics do not resolve the skin infection. Greene, Craig E. Infectious Diseases of the Dog and Cat, 4th Elsevier Saunders 2012, 325 – 347. Campbell, Karen L.; Griffin, Craig E.; Miller, William H. Muller & Kirk’s Small Animal Dermatology, 7th Elsevier Mosby 2013., 184 – 207.